You know, we’d always suspected it might be the case, and now an Australian study has confirmed it: women are more sexually attracted to stronger looking men. In the survey carried out at Griffith University in Queensland, researchers found they could predict how attractive a woman would find a man based on three things - how physically strong he looks, how tall he is and how lean he is. These factors accounted for 80% of a man’s ‘attractiveness,’ above face shape, hair colour and facial features. But, if that wasn't enough to get you to pick up a barbell, there are many more benefits. Here are just a few. 31%. That's the worryingly small amount of British men who test themselves in the weights room, according to a new survey from YouGov. That’s right, more than two thirds of men spend all week without lifting a barbell. But does it really matter? In two words: hell yes. Whether bodybuilding’s your bag, you’re crazy for calisthenics or you’re just looking for a post-work way to shear off that beer belly, weightlifting is the best cure for lots of ailments. Although there's stacks of medical advice recommending resistance training, we believe weightlifting is as good for the soul as it is for the body. It's a primal feeling, but there's enough scientific clout behind it to dispense with all the macho-sentimentality. There’s a reason we’re always touting lifting at Men’s Health; or rather, 8 reasons. And here they are. With work stress harming 428,000 Britons, your daily grind isn’t just making you unhappy – it’s killing you. Enter the gym – the ultimate stress-bursting dojo, where crushing a deadlift PB is guaranteed to make you feel euphoric. But don’t take our word for it: the International Journal of Sports Medicine found significantly decreased cortisol levels in people that weight-trained for two weeks. Cut your PBs and your stress down to size. Your coronary worries can be assuaged with a good day’s lifting. 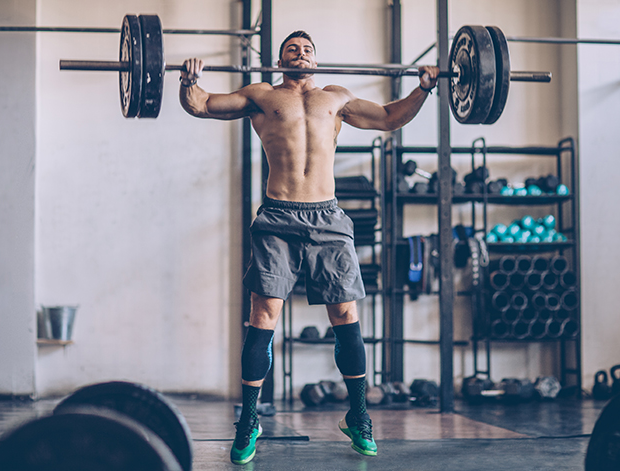 The Journal of Sports Medicine has shown that weightlifting can favourably affect heart disease risk factors and recommends those already suffering begin resistance training. Our 15 ways to improve your heart health just became 16. Put down the wrinkle cream; here's how to cheat death for real. The Journal of Applied Physiology suggests that weightlifting actually goes some way towards reversing the effects of ageing in bones. In addition, pumping iron has been proven to reduce the presence of a chemical called myostatin in the body, which the journal Ageing Cell says can decrease your lifespan by up to 15%. Get down the gym and prepare to lift your life longer. If you're the sporty type, you may feel like more hours on the pitch and less in the gym will have you better prepared for the game. But the crafty athlete uses everything available. The Journal of Strength and Conditioning Researchstates that a weights programme enhances any performance that requires high-load speed and strength. That would be everything except chess, then. Struggling for a sound snooze? Grab a bar. Weightlifting tires your muscles out, but combined with the stress relieving effect, lifting contributes loads to a good night's sleep. In fact, Clinics in Sport Medicine says that exercise in general and weight lifting in particular is the cause of your sleep serving you better during the wee hours. Instead of counting sheep, count reps.
Type-2 diabetics should be getting to know the weights room. The American Diabetes Association has shown that lifting weights improves glucose control in pre-existing diabetics and helps prevents those on their way from tipping the scales. It does this by enhancing insulin sensitivity in the bloodstream, meaning your deads will help you show diabetes the door. Take that godawful dayglo running gear off; science has proven that more calories are burned through strength training than steady-state cardio. It's theJournal of Strength and Conditioning Research again, proving that a training programme incorporating two days of strength training for every one day of cardio burns more calories than an entirely steady-state cardio regime. That's not to say that cardio isn't important - it is - but dependent on your individual goals, weight training can and should be the crux of your regime.